Directions to Peaceful Acres Lavender Farm from Cincinnati, Dayton & Columbus Ohio. Peaceful Acres Lavender Farm is located 40 minutes from Cincinnati and Dayton, Ohio & 1 hour from Columbus, Ohio. Take I-275 to Milford Exit #57 State Route 28, go East 21 Miles on Rt. 28, Turn Left on Martinsville Rd (Martinsville Rd. will be 4.5 miles from St. Rt. 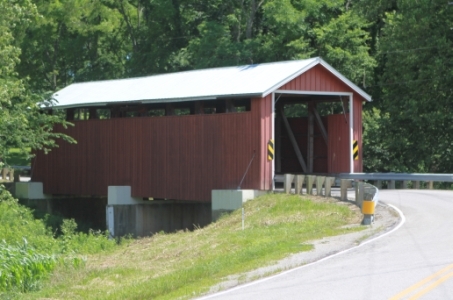 28 and 68 intersection) Farm is .3 miles from Historic Covered Bridge. Take I-71 North, Wilmington Rd Exit #36, Turn Right of exit, Immediately Turn Right 1st street Middlesboro Rd, 1st stop sign Turn Left on State Route 350, 12 miles cross under St Rt 68 bridge, after bridge 200 yards 1st street Turn Right East C Street, 100 yards 1st street Turn Left on Martinsville Rd, 2.5 Miles on the Left. From Columbus: I-71 South to Exit #50 State Route 68 South, 6.8 Miles State Route 350 Turn Left off exit heading under the bridge, after bridge 200 yards Turn Right on East C St, 100 yards 1st Left on Martinsville Rd, 2.5 miles on Left. State Route 35 East to State Route 68 South Exit, Follow Rt. 68 21 miles south to State Route 350 exit Turn Left off exit heading under the bridge, 100 yards 1st street Turn Right on East C St, after bridge 200 yards take 1st Left on Martinsville Rd, 2.5 miles on Left.